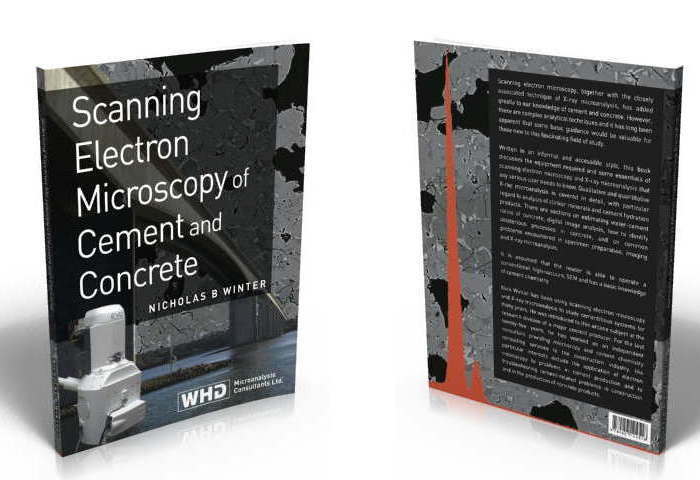 Essential reading for anyone who uses, or is planning to use, scanning electron microscopy and X-ray microanalysis to examine cement, concrete or mortar and needs to get good results quickly. "Your time on the SEM is valuable. With this book you could save many hours - and get better results"
Written in an easy-to-understand and informal style, this new book covers the basics of how to apply the techniques of scanning electron microscopy and X-ray microanalysis to cementitious materials. Starting with simple imaging of fracture surfaces, the book then progresses to more advanced techniques of quantitative X-ray microanalysis and digital image analysis using polished sections. To aid identification, examples are shown of images and X-ray spectra of all the main cement clinker minerals and cement hydration products. A chapter on how to identify deleterious process in concrete, including alkali-silica reaction and sulfate attack, shows illustrative examples of images and X-ray spectra of the principal causes of damage to concrete. In the "Troubleshooting" chapter, many of the problems are described that can arise in specimen preparation or analysis, and what to do about them. Most of the techniques described can be carried out using a conventional, high vacuum, SEM although specific applications where it may be advantageous to use the more complex ESEM are briefly discussed. "This book provides a comprehensive and refreshingly accessible guide to what is still an underused and frequently poorly-understood technique." "An outstanding book in terms of readability, written from a pragmatic perspective with clear enthusiasm! I found the relatively informal style refreshing in comparison to often overly-stuffy texts on analytical techniques and on cement and concrete, without losing any impact." "With EDX of cementitious material there is much potential to waste weeks of your life chasing repeatable and worthwhile results. Nick Winter clearly explains where analytical variables may occur and provides the reader with a robust strategy for achievement of excellent results. A must-read for all serious practitioners!" "An essential lifeline for those wishing to study electron microscopy of cement, or geological investigations or research using cement as an example." Nick Winter has been using scanning electron microscopy and X-ray microanalysis to study cementitious systems for thirty years. He was introduced to this arcane subject at the research division of a major cement manufacturer. For the last twenty-five years, he has worked as an independent consultant providing microscopy and cement chemistry consulting services to the construction and other industries, based principally on scanning electron microscopy. To see the Table of Contents, right-click on this link (opens in a new window or tab): download Table of Contents here. This book contains the most important techniques, tips and lessons I've learned over 30 years of using SEM/EDX to study cementitious materials. There's no set syllabus in learning how to "do" SEM of cement and concrete, so I've included everything that I've found to be most useful. The writing style is intentionally informal, the content of the book what we would be talking about if we were sitting together at your SEM. Whether to use a normal, high vacuum, SEM or an ESEM? When should you be using polished sections? What type of imaging should you be using? What's the best accelerating voltage to use? How do you know if the equipment is working properly? There's a chapter on how to recognise the main clinker phases and cement hydration products, both from their appearance in the SEM images and from their X-ray spectra, three chapters on quantitative X-ray microanalysis, one on digital image analysis and another on how to recognise deleterious processes in concrete such as alkali-silica reaction and sulfate attack. There's a chapter on troubleshooting - what to do when it all goes wrong - and Appendices on making polished sections and a suggestion for doing digital image analysis on a tiny budget, if you don't already have the equipment. Just to avoid any confusion, don't expect this book to tell you how to operate every SEM or EDX system; that would obviously be impossible. For example, it suggests what accelerating voltage you might use, but it can't tell how to change it on your particular SEM; you need to know that. On the subject of clinker examination by SEM, it tells you how to analyse the clinker minerals, but it is not a guide to interpreting what you see in the context of cement production. That is a subject in its own right, probably of interest to only a minority of readers, and so would be best in a separate volume. Also, this is not specifically a book on cement chemistry. If you know some cement chemistry, that's great. If you are a little rusty, the level of knowledge assumed in this book is that contained in the Understanding Cement e-book, also available from this website. In all, if you are new to SEM of cementitious material, this book should save you hours or weeks or even months, by starting you off on the right track - saving you a lot of time, money and frustration. (If you hire your SEM by the hour, this book will probably pay for itself on the first day!) Even if you are more experienced, I hope there will be much here of interest for you. Good luck in your studies of cement and concrete. How to order "Scanning Electron Microscopy of Cement and Concrete"
The book is available ONLY direct from the publisher via this website. You won't find it in bookshops or on Amazon. When you place your order, your copy is printed especially for you using "print on demand" technology. When it has been printed, it will be posted to you. In a bookstore, you can look through a book before you buy. You can't do that here, so we offer a 60-day money back guarantee. Try "Scanning Electron Microscopy of Cement and Concrete" now, risk-free. If you decide it isn't for you for any reason, just return it in good condition within 60 days and we'll refund what you paid for the book (less shipping), no questions asked. 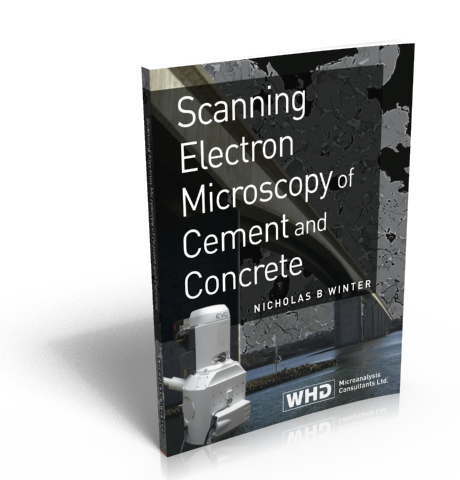 "Scanning Electron Microscopy of Cement and Concrete" can be obtained through the link below. Simply click on the image of the book and this will take you to the shopping cart where you can review your purchase. The shopping cart will give you two options: you can either purchase it direct from us using PayPal, or you can obtain it through 2Checkout.com, Inc.. 2Checkout.com is an authorised retailer of our products. By either route, payment may be made by card or by PayPal account. Get your copy now, risk-free, for only $97.00 USD (+$10.00 postage and packing) and start to see cement in black and white! I am currently offering all purchasers of the book a free 30 minute consultation using Skype. You can ask me anything you like concerning SEM of cement and concrete and I will try to help. Clearly, I can't guarantee to be able to assist with every topic, for example I can't tell you in detail how to operate your particular SEM or EDX equipment - there are just too many different makes and models. Also, if you are using some unusual materials I'm not familiar with, don't expect too much detail! This offer may be helpful if you have a particular problem and are unclear how to go about solving it, or if you would like a more general discussion on some particular issue, or if you don't have anyone available familiar with SEM of cementitious materials and you would like to discuss something in particular. Again, I can't promise to be able to help but I'll do my best. In most cases I can probably suggest broadly what you need to be aiming to do. Obviously, this is a very limited offer as there are only 24 hours in a day so this offer is likely to disappear very soon. You can take advantage of this offer any time in the three months after your purchase. Our Skype discussion will be at a mutually convenient time we can arrange by email. I suggest that you wait until you have received the book and read through it before you email me to fix a date and time as the book may well contain the answer to some of your questions. "Scanning Electron Microscopy of Cement and Concrete"